Broadcasting on Brisbane’s 4ZZZ (fm 102.1, Fri 12 noon) we look at and challenge our society’s current concepts, values, assumptions and practices. We show possible (and existing!) alternative ways of being and doing. We are informed by the urgent need for Social Justice in the world. Queensland Jobs Cut – edge of darkness? Interview with Nick White about local govt. elections. Nick is an independent candidate in the 2012 Ipswich City Council elections. He talks of his concerns about the pro-development nature of the present council, about lack of democracy and the need to clean up the Bremer River at Ipswich. A regular participant on Paradigm Shift, Robin, reports from Dallas in Texas – home of George W Bush, oil millionaires, the ‘grassy knoll’, and conservative America. Robin describes how refugees from Hurricane Katrina in New Orleans and Mexico and GFC have combined to lay the foundation of Occupy Dallas. The interview was prepared by Eliza and is in two parts. It was broadcast on 4ZZZ on 14 October 2011. Quandamooka first nation spokesperson, Dale Ruska, talks with Eliza and Ian on the Paradigm Shift (4ZZZ 102.1 FM Brisbane Fridays 12 Noon) about the recent native Title declaration over Minjerribah (Nth Stradbroke Island). He explains his disappointment and outlines its effects on his people. What rights will Quandamooka people have over Minjerribah (Nth Stradbroke island)? What economic activity (fishing, mining, water extraction, tourism, the arts) will Quandamooka people be able to conduct on Minjerribah? What rights will be permitted and what rights have been extinguished? What input did you have as a claimant (a first nation person) in the (native title) determination? Was there informed consent to the native title determination by the Quandamooka people? There have been some changes on the island recently – for example (there has been) an extensive upgrade of the gorge walk at Point Lookout – who did that work and were the Quandamooka people consulted? There have been some changes on the island recently – for example there has been an extensive upgrade of the gorge work at point Lookout – who performed that work and were the Quandamooka people consulted? Can Quandamooka say what activities are performed on the land – especially the land subject to exclusive native title? Last weekend the state government put a full page advertisement in the Australian newspaper naming (with colour photos of each person) various people who can take credit for ‘pursuing land justice’. As the original native title claimant (in this 16 year long struggle) why weren’t you included? How do you feel about that? A speaking tour by Cuba’s Principle Energy Efficiency and Renewable Energy Educator, Mario Alberto Arrastía Avila tours Eastern Australia in July/August, 2011. Sam Watson introduces Raymond Walker at the annual Invasion Day Rally in 2011. Raymond sings traditional Welcome song. Beautiful song that won the Oscar for Best Song in the film Motorcycle Diaries about Che Guevara.The composer of the song, Jorge Drexler, was not permitted to sing the song at the Oscars because ‘he was not well enough known’, Jorge sang it a capella as he was handed the Oscar. We (Little Secrets) usually play this as our opening tune as our acknowledgement of and respect for the people who have lived in this country for so long and for the injustice handed out to them by the invaders. is a perfect example of a truly great Australian; the antithesis of the media “hero” full off puffery and self importance.—Tony Mockeridge dedication of song to Lex Wotton and his family. Interview with Khalil Hamdan on the Paradigm Shift on 4Zzz. Interviewers are Eliza and Ian. Khalil is one of the 1948 refugees from Al Jammasin in Palestine. His family were driven from their village by the Israeli militia – the Hagannah & Stern gangs. Khalil speaks of his history and of recent visit to Palestine in Feb 2011, what he saw and what his hopes are for the future. 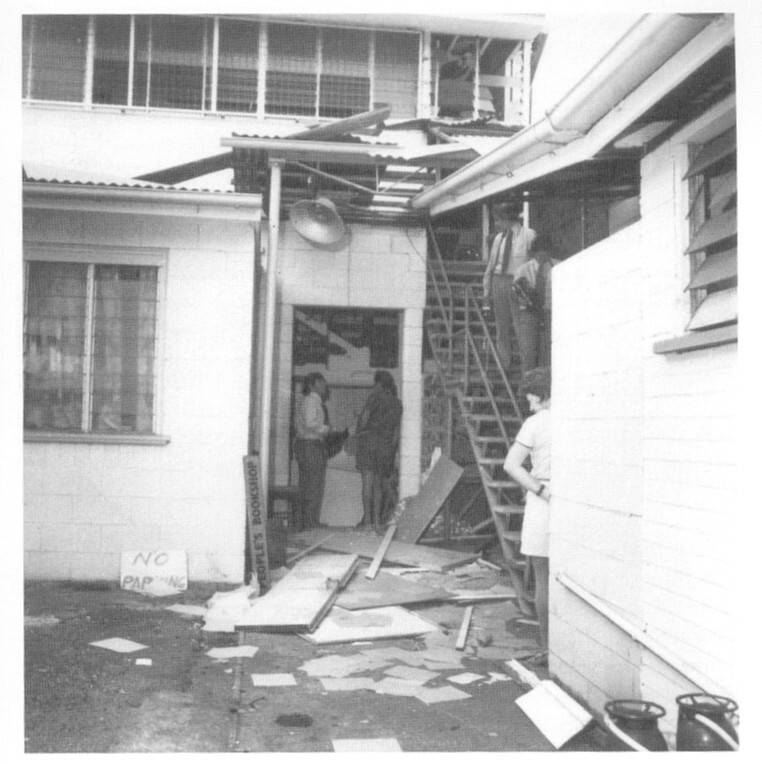 Forty years ago today, a neo-Nazi bombed the Communist Party’s headquarters in Brisbane using 16 sticks of gelignite. On the same night, shots were fired into a left-wing bookshop, in attacks timed to coincided with Adolf Hitler’s birthday. No one was killed or injured, but a newspaper editorial called it “the worst political violence Queensland had ever seen”. The self-confessed bomber claimed to have links to the corrupt Special Branch police unit of the Joh Bjelke-Petersen government and was acquitted of the crime. As neo-Nazis prepare to hold a secret gathering in Brisbane this weekend, Queensland correspondent Stefan Armbruster spoke with a survivor of the 1972 bombing, Ted Riethmuller.CPA Building ‘291’ now 4ZZZ bombed in 1974 – interview with Ted Rethmuller by SBS’s Stephen Armbruster. Not all that happens in war is air cover, cruise missiles and shelling. For example the very lives of people – the fact that they exist – can be a form of resistance. ‘If that is the way you feel’ he replied, ‘why don’t you think about becoming like a Palestinian in your own country?’ Her father had lost a leg to a land-mine when Russians invaded Afghanistan in the 1980s. This had a deep impact on Malalai and she thought about what her father had said for days, she wanted to work to end what was going on in Afghanistan, and perhaps her father was showing her the way. Malalai Joya was inspired by Palestinians and with support from her family returned to her home province, Farrah, and taught girls in underground schools. This was the time of the Taliban who forced men to wear beards like fists and forced women to wear burkas and refused girls an education. Ironically, ‘Talib’ means ‘student’. What was it about the Palestinians that inspired Malalai Joya? While going through an Israeli checkpoint on the West Bank a teenage girl describes what happened. “The Israeli soldier pointed to my violin case. He said, ‘What’s that?’” 13-year-old Alá Shelaldeh, who lives in old Ramallah, told me. She is a student at Al Kamandjati (Arabic for “the violinist”), a music school in her neighborhood. She was recalling a time three years earlier when a van she was in, full of young musicians, was stopped at an Israeli checkpoint near Nablus. He told me to get out of the van and show him.” Alá stepped onto the roadside, unzipped her case, and displayed the instrument for the soldier. “Play something,” he insisted. Alá played “Hilwadeen” (Beautiful Girl), the song made famous by the Lebanese star Fayrouz. It was a typical moment in Palestine, and one she has yet to, and may never, forget. In June, Alá Shelaldeh, the 13-year-old violinist, brought her instrument to the wall at Qalandia, once a mere checkpoint separating Ramallah and Jerusalem, and now essentially an international border crossing with its mass of concrete, steel bars, and gun turrets. The transformation of Qalandia — and its long, cage-like corridors and multiple seven-foot-high turnstiles through which only the lucky few with permits may cross to Jerusalem — is perhaps the most powerful symbol of Israel’s determination not to share the Holy City. Alá and her fellow musicians in the Al Kamandjati Youth Orchestra came to play Mozart and Bizet in front of the Israeli soldiers, on the other side of Qalandia’s steel bars. Their purpose was to confront the occupation through music, essentially to assert: we’re here. The children and their teachers emerged from their bus, quickly set up their music stands, and began to play. Within moments, the sound of Mozart’s Symphony No. 6 in F Major filled the terminal. As the Mozart symphony built – Allegro, Andante, Minuet, and the Allegro last movement — some of the soldiers started to take notice. By the time the orchestra launched into Georges Bizet’s Dance Boheme from Carmen #2, several soldiers appeared, looking out through the bars. For the briefest of moments, it was hard to tell who was on the inside, looking out, and who was on the outside, looking in. Sadly, a majority of Australians do not support Palestinian, Iraqi or Afghani people. Australian political parties have supported imperialism in these countries. New parties base their popular appeal on fear of refugees fleeing wars, on blaming the impoverished for taking social security and jobs. The dominant position in Australia is support for the US and Israel – the dominant paradigm is on the side of the occupiers. When Obama vetoes Palestinian bid for statehood in the UN he is expressing the views of the US and therefore Australia. This is a shame, but it is true. It is not Obama, Rudd or Gillard that determine these things. It is corporate and military power that dominates the US and Australia, and these determine our countries’ stance against justice and freedom in the ‘Middle East’. However those who point out that the apartheid wall in Israel is a mistake will be proven right, in the end. Change began when Palestinian people, many of them children, withstood Israeli bombing of Gaza in 2008, when Lebanese and Palestinian resisted Israeli bombing of Lebanon in 2006, when the people of Bi’lin on the west bank resist the apartheid wall and so on. The wall is wrong. It makes people of Israel less able to develope and share their common humanity and culture with Palestinians. Once Palestinians – Muslims, Christians and Jews – lived in harmony (prior to UN recognition of Israel in 1948). Since then, two wars (1947 & 1967) and the apartheid wall have sought to destroy peace. This cannot last. No one can say how the deadlock will be broken but the wall and what it stands for will fall. Even the wall itself has come to represent resistance. Huge murals depict aspirations of the people being painted on it every day. Marrickville council in Sydney recently stood against apartheid in Palestine by supporting Boycotts Divestments and Sanctions against Israel (BDS). Because dominant ideology here in Australia supports US and therefore Israel, that position on Marrickville council has been overturned and the mayor (Fiona Byrne of the Greens Party), who supported BDS, has vacated the position of Mayor and will not seek re-election on council. An independent who supports Israel replaces her as mayor. At the outset of the BDS and anti-war campaigns people may have been naive to think that the dominant position in Australia was otherwise. People urged for grass roots campaigns but attempts at this have been frustrated and resulted in a backlash. This has understandably brought calls for caution – but caution must not become impotence. We need to organise better, ask more questions, and be more creative. Regardless of what happens, those who support an end to occupation in Palestine, Iraq, Afghanistan, the bringing down of the apartheid wall in Palestine, and equal democratic rights for citizens right across the Middle East and Afghanistan — are part of an intifada (uprising) that will eventually prevail.